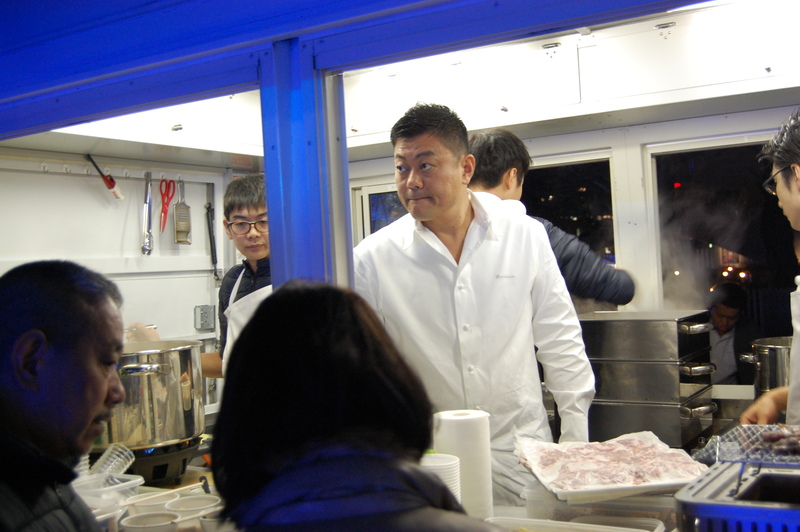 Starting January 7 and running through March 8 adjacent to the Diner’s Club Ice Rink in Roppongi, chef Yoshihiro Narisawa is serving cuisine from his first Kitchen Car. 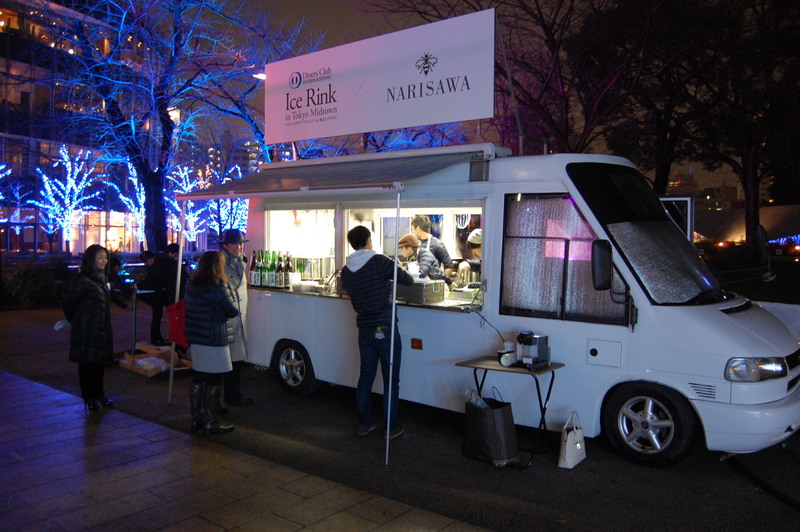 I much prefer the name the Japanese have given to food trucks, kitchen cars. If you are at all familiar with chef Narisawa’s gorgeous and spacious kitchen at his restaurant, you can understand the big change it is for him. 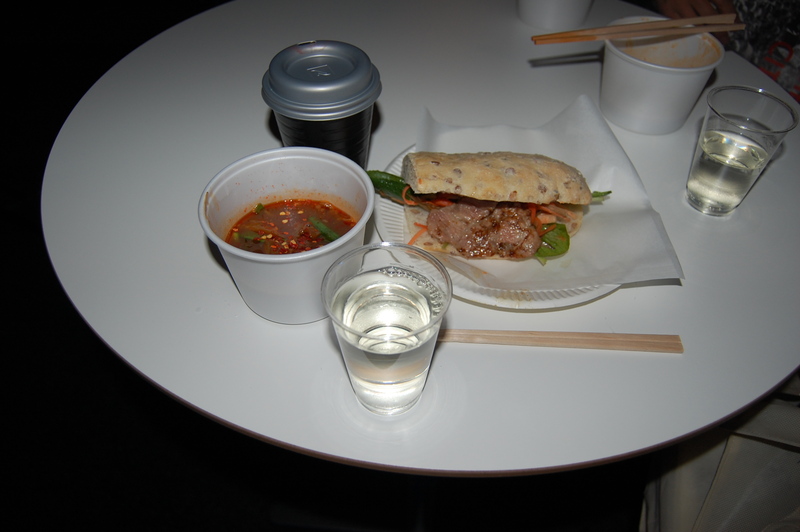 The menu at last night’s press event included grilled Hiroshima oysters, soups, and sandwiches. The soups are classic regional styles from the north to the south. – Hokkaido’s Ishikari Nabe is made with salmon, vegetables, and miso – a staple for Hokkaido winters. 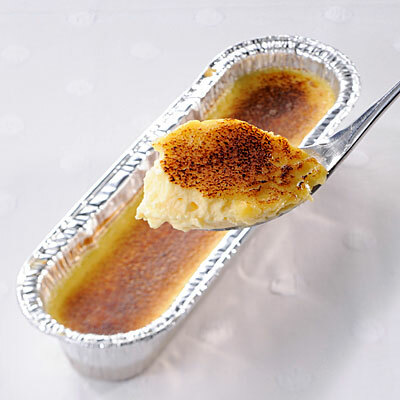 – Kyoto’s Shiro Miso Ozoni combines grilled rice cakes with a sweet, white miso. – Hakata Motsu Nikomi is wagyu offal simmered in a spicy miso soup. The sandwiches are made with an 18-grain flour and are filled with pork, chicken, or vegetables. The menu will be changing throughout the 61 days of the event, encouraging diners to come back. Most impressive was the list of farmers and producers who are collaborating with Chef Narisawa for this event including some of my favorites like Okui kombu from Fukui, Hida Gyu from Gifu, and Sanshu Mikawa mirin from Aichi. It’s a long list and there is a map in front of the kitchen car highlighting where the different ingredients are procured from. There was sake as well last night, including Fukushima’s Daishichi Kimoto, a nice partner to the motsu nabe. Even if you are not an ice skater, a visit to Roppongi Midtown is a great excuse to check out the great food shops on the first floor. Narisawa’s Kitchen Car is just across the street from the food court. Now through March 8th. 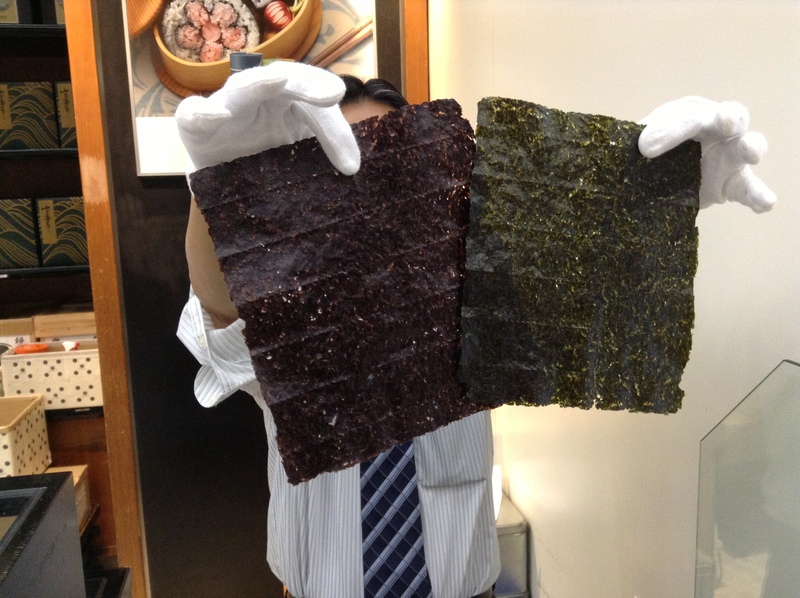 Hours are 11 a.m. to about 9 p.m.
Can you tell the difference between the nori on the left and the right? 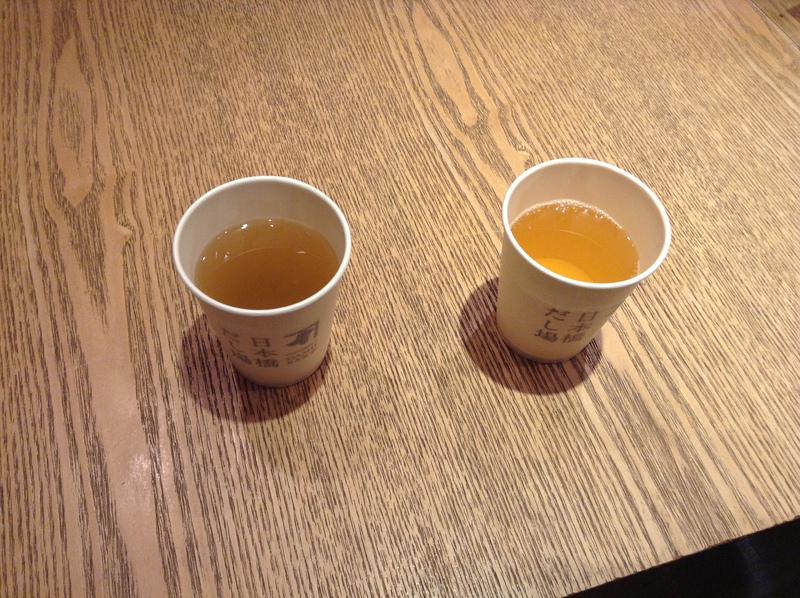 Two types of dashi, both using katsuobushi. What better time to learn about washoku? It seems that UNESCO will recognize the unique cuisine of Japan as an Intangible Cultural Heritage in December. If you are curious or passionate about Japanese cuisine and would like to know more about it, there will be a 90-minute walking tour of some of the historic shops in Nihonbashi. Learn more about umami, some ingredients from the Japanese pantry, and Japanese cuisine. The tours are at 11 a.m., 1 p.m., 2:30 p.m., and 4 p.m. on Friday, November 1st. The tours are in English. For more details, please contact me directly. Our e-mail is on our “Yukari and Shinji Sakamoto” page. Hanamaru Market is a morning television variety program. While it is not a food program, it introduces the favorite food of each day’s guest. I have found this program a great way to be introduced to products I would not necessarily come across. Food items include regional items from guests’ hometowns to some local favorites in Tokyo. The Omeza Fair at Shinjuku Odakyu is a food fair that introduces some of these popular foods. Some of my favorites include Azabu Juban’s osembei shop, Mamegen’s shio okaki. These deep-fried rice crackers are simply seasoned with salt. These are addictive so watch out. From Kyoto, Gion Kinana’s kinako ice cream, an ice cream flavored with toasted soybean powder, and Izumiya chirimenjako, small sardines and sansho peppers, perfect for topping over a bowl of rice. As well as pickles, mentaiko, umeboshi, gyoza, shumai, pork buns from Nagasaki, and much, much more. If you are in Shinjuku stop by as it is near the station. The event runs from today until Tuesday, October 4th. 10 a.m. to 8 p.m., on the last day the event closes at 5 p.m. This weekend through Monday the 12th, stop by Takashimaya Nihonbashi’s 8th floor (large event space) for a special food festival featuring the food of the Tohoku region. My mother is from Yamagata so Tohoku holds a very special place in my heart. Shinji also works with many fishermen from Aomori to Iwate and Miyagi so many of the seafood producers from this region are treasured. Tohoku needs your support now more than ever. 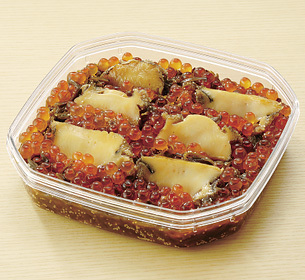 Highlights include the awabi, ikura, and mekabu (in photo above) from Iwate, konnyaku balls from Yamagata, kamaboko from Miyagi, and much, much more. Note that these events usually close early on the final day (Monday the 12th), most likely closing at 5 p.m. But call ahead to confirm. Keio department store in Shinjuku will showcase the unique food of Okinawa at a food fair from Thursday, May 12th to Tuesday, May 17th. Do stop by if you are in Shinjuku. Highlights include an eat-in corner where you can order a bowl of the local noodles, soki soba. Other foods to try include rafute, pork simmered in a soy broth until tender, local vegetables like goya (bitter gourd) and tropical fruits such as passion fruit. 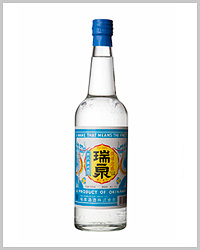 But what is worth the trip is to pick up some bottles of awamori, the local distilled spirit made from Thai rice. At these food events it is common for representatives from the awamori distilleries to come and pour samples of their product so come and taste through a few to see what you like. Be sure to try some ku-su, aged awamori. Advertisements for the event say that there will be a five-year aged awamori. Keio is located near the Nishi guchi (west exit) of Shinjuku station. The event is on the 7th floor. The event closes at 5:00 p.m. on the final day, Tuesday, May 17th. An insider’s tip when visiting department stores is not to limit yourself to the basement’s depachika. Inquire at the concierge if there is a special food event on the event floor, usually the top floor. Today through April 12th at Keio in Shinjuku the food of Hokkaido is featured on the 7th floor. Hokkaido is known for its seafood, in particular the winter may be the best for crab, uni, ikura, and scallops. The green grass and open fields is home to cows, needed for milk for Hokkaido sweets. 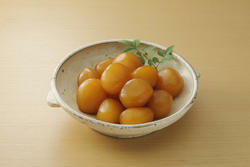 The photo above is a caramelized frozen custard from a shop called Sapporo Catalana. If you like ramen you’ll have the opportunity to eat local Hokkaido ramen at special eat-in counters. 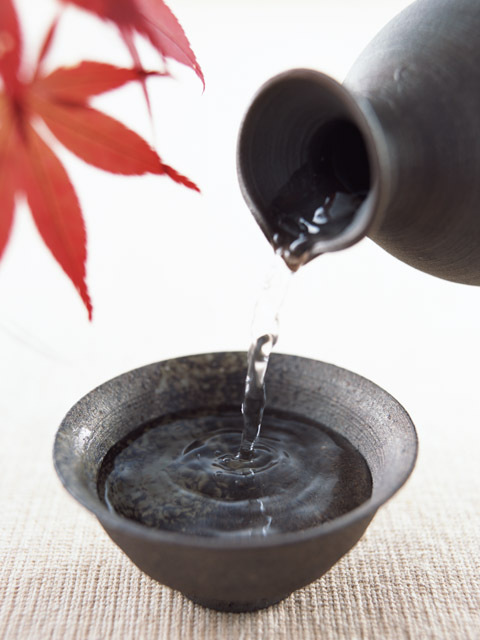 Most likely there will be local nihonshu – often with free tastings before you purchase. This is also a great opportunity to interact with the purveyors directly. Do stop by if you are in Shinjuku. It is just outside of the Nishiguchi (West exit). The last day the event closes by 5 p.m. so don’t be late.